Kayaking is a versatile watersport is a great way to spend quality time with friends and family while exploring nature from a new point of view. The EZ Dock family is full of water enthusiasts who have fallen in love with the adventure that an afternoon of kayaking offers. If you’re looking for a fun and exciting way to enjoy the open water, kayaking just may be the perfect new hobby for you. To get started, we’ve pulled together the tips and tricks we believe beginning kayakers should know. Why Should You Go Kayaking? Kayaking is great exercise: If you’re looking for an outdoor exercise routine that provides a high energy workout with low impact on your joints and tissues, kayaking is a worthy option. It can increase your cardiovascular fitness and strengthen your core, arm, back, shoulder and chest muscles. You can kayak in any body of water: Our wonderful world is full of diverse environments which can be explored from the seat of your kayak. With portable equipment that can be easily launched from any dock, riverside or shore, your kayak can travel with you to some of the most beautiful destinations in the world. River, lakes, oceans and more — your possibilities for exploring are endless. Kayaking is a fun and exciting way to spend time with others: Grab a group of your closest friends and paddle down a river rapid or gather the family and enjoy a picnic after a relaxing coast on the lake. Kayaking can be as challenging or relaxing as you and your group desire. 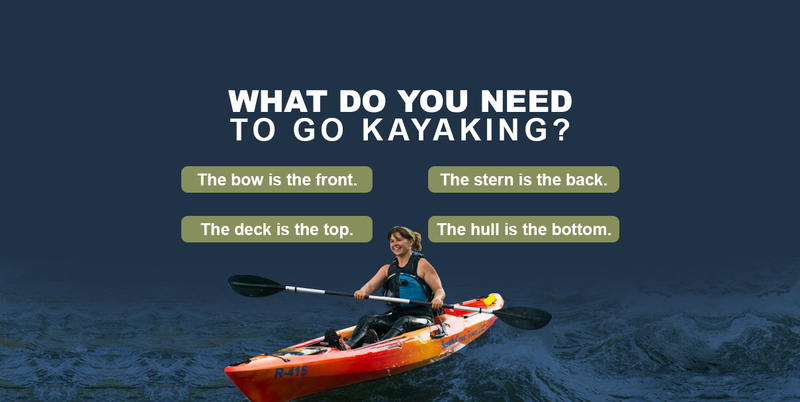 What Do You Need to Go Kayaking? Paddle: A paddle is as essential as the kayak itself. When choosing paddles, you’ll need to consider the measurement of your torso and the width of kayak you’ll be paddling. There are sizing charts available but generally, torso heights over 28 inches will use paddle lengths of 200 centimeters and above, torso heights under 28 inches will use paddle lengths under 200 centimeters. Lifejacket: A Personal Floatation Device is a critical piece of equipment that you should always have when engaging in any watersport. A lifejacket should fit comfortably snug, meaning it fits well without feeling too tight or too loose. Bilge pump: A bilge pump or bailer is necessary in case you need to quickly bail water out of your kayak. What Are the Different Types of Kayaks? Sit-on-Top kayaks: Many people are familiar with this type of recreational kayak. It does not have an enclosed seat, so it’s easier to enter and exit compared to other variations. They are wider, provide more stability and are generally better for beginner kayakers. Touring kayaks: Touring kayaks are long with small cockpits. Their narrowness and length make them a good choice for a more involved kayaking experience such as taking longer trips across lakes. Recreational kayaks: These kayaks have slightly larger cockpit openings than touring kayaks. Recreational kayaks are also shorter in length and are ideal for calmer kayaking experiences. Whitewater kayaks: Whitewater kayaking is a more challenging endeavor than leisurely paddling across lakes and ponds. There are four different types of whitewater kayaks — playboats, river runners, creek boats and longboats — each of which has advantages depending on where you plan to use it. Inflatable kayaks: Similar to sit-on-top kayaks, inflatable kayaks are easy to transport and operate. They are best used for a more relaxed kayaking experience in calmer waters but there are inflatable whitewater kayaks available. Child-Sized kayaks: There are also kayaks available in smaller sizes for children and youth kayakers to use. Before you learn how to ride in a kayak, you first need to learn how to get in and out of a kayak. Getting in and out of a kayak can be tricky, but we’re confident that after a little practice, you’ll catch on quickly. 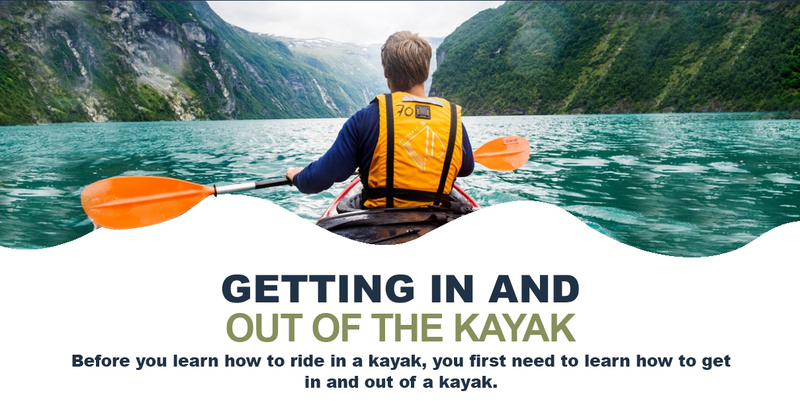 Put simply, there are two different ways which you will likely enter a kayak — getting into a kayak on land or in shallow depths of water, or getting into one that’s already in deeper water. Both options have their advantages and challenges. Getting into your kayak from the shore is much easier, especially for those who are learning to kayak. Whether it’s a lakeside, sea shore or riverfront, the best way to begin is to move the kayak as close to the shoreline as possible. You can then sit in the kayak and use your arms to push yourself into the water until you are floating on the surface. If you’re concerned about scratching your hull on the ground, move the kayak into the shallow water and climb in there. Getting into your kayak from a dock involves a little more skill. Lower your kayak from the dock onto the surface of the water, making sure to keep the kayak parallel to the dock. 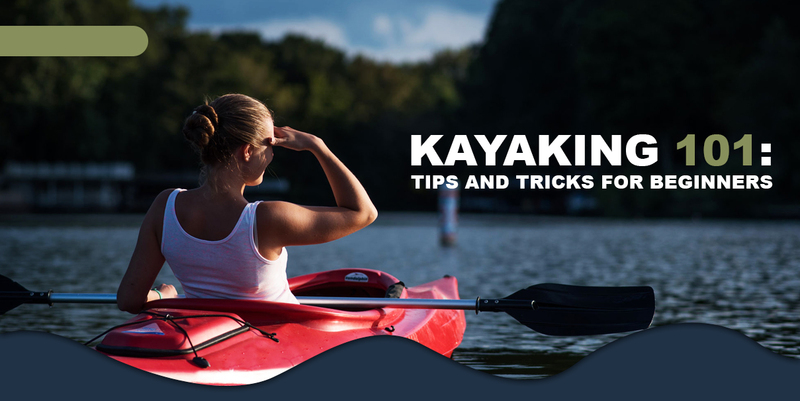 You can keep your kayak from shifting positions by placing either end of the paddle on the kayak and the dock. As you’re sitting on the edge of the dock, lower your feet into the kayak first. Then, quickly position your body towards the front of the kayak and lower yourself into the seat. The instructions for how you get out of a kayak are easy to remember — just complete the steps in reverse. When exiting on the shore, paddle your kayak into shallow water or as close to the land as possible. Swing your legs out of the kayak, gain your footing and stand up. When exiting the kayak on a dock, turn your body to face the dock and pull yourself out of the kayak. Thankfully, many docking systems built today can easily accommodate kayakers of all abilities and skill levels. Our passion for spending time on the water has led us to create floating kayak launch systems to make getting in and out of the water a breeze. Our EZ Launch System and EZ Launch Accessible Transfer System features launch rollers, guide rails and an adjustable floating platform that caters to the needs of all ages and abilities, meaning you can launch (and dock) your kayak with total confidence anytime. Once you’ve practiced getting in and out of the kayak, it’s time to learn about paddling techniques. The first step is to ensure you have picked out a paddle of proper length. Our guide to selecting a kayak offers detailed insights on choosing the right paddle length for you. Before getting into the water, all beginners should first learn how to handle the paddle.The part of the paddle you hold is called the shaft. The proper way to hold a paddle is to place your hands slightly farther than shoulder width apart on the shaft. Oftentimes, one mistake that beginner kayakers make is holding the paddle incorrectly. One side of the blade is concave and should always be facing you. Slice the paddle blade vertically into the water, keeping a relaxed grip on the shaft with your knuckles pointed upward. Keeping this form will put more power into your paddle without exerting more energy. What Are the Basic Types of Paddle Strokes? With paddle in hand, you can now learn basic paddling strokes. There are four essential kayaking paddling techniques you should know — forward stroke, backward stroke, sweep strokes and draw stroke. These strokes will enable you to move forward, backward or sideways in your kayak as well as help you turn around. This basic stroke moves your kayak forward. Submerge one end of the paddle in the water near your toes. Next, propel the kayak forward by pulling the blade back towards your hip. While pulling the paddle blade out of the water, rotate your body forward while dipping the opposite blade into the water. This stroke moves your kayak backward. Submerge one end of the paddle in the water between your body and the stern (which is the back of the kayak). Look behind you and propel the paddle forward towards your toes. Allow your body to rotate back into a square sitting position and repeat the process on the opposite side. Use sweep strokes to turn your kayak. Place the end of the paddle in the water by your toes against the bow, or front, of the kayak. Draw back the paddle in a half-moon arc towards the stern of the kayak. Rotate your torso with the paddle. Place the end of the paddle in the water against the stern of the kayak. Draw the paddle forward in a half-moon arc towards the bow of the kayak. Use the draw stroke to move your kayak sideways. Stick the blade of the paddle in the water in the direction you want to move and rotate your torso in that direction. The paddle should be far enough out from the kayak that both of your hands are over the water. Pull to draw your kayak towards the blade. Pick a small lake or pond that is calm and one which you can see the opposite shoreline. Bodies of water that don’t have heavy powerboat traffic are a plus because it will limit the number of unnatural waves you’ll have to face. Launch your kayak from a shore that is visible to others on land. If you’re kayaking alone or are with a group that is remaining on the beach, your kayak will be in plain view should you require assistance or emergency help. Plan your first few trips to be short and safe. Choose a bright and sunny day that doesn’t have a forecast of rain or high winds to keep your environmental challenges as predictable as possible. Also, know your limits and underestimate the amount of time you can safely kayak before you get fatigued. Like other workouts, you don’t want to overdo your first kayaking trips and make it difficult to paddle back to shore. Limit your first trip to an hour and then extend as you feel comfortable. How Do You Kayak During Sudden Weather Changes? Depending on where you’re kayaking, the weather could change in an instant. Although you planned a trip on a perfect day, you should still be aware of what to know about kayaking during times of bad weather. You may not know how hard it is to kayak in a rainstorm until you’re stuck in one, but there are a few kayaking skills and techniques for beginners that can help you avoid trouble and make it safely back to shore. You should expect any amount of wind, from a small breeze to a huge gust, to have some effect on your kayak. This is normal, and you can readily compensate for it. To conserve energy, paddle with the wind and not into it if you can. You can also paddle harder, use a rudder or add an extra stroke to your downwind side in order to make adequate wind corrections. If you lose control of your kayak, don’t fight it. Imagine driving down a road and losing control of your car due to ice, dirt or other slick conditions. Trying to regain control of the vehicle abruptly could cause you to overcorrect and make the situation worse. Instead, it’s best to maintain as much control of the car as possible and move in the direction of the vehicle. The same applies to kayaking. If you suddenly start to spin, move with the kayak and adjust accordingly. There’s also a chance your kayak may roll over, putting you underwater. Staying centered in the kayak and wearing a life jacket will help in this scenario. If you tip without wearing a life jacket however, stay calm and immediately grab the kayak and the life vest if it’s attached to the vessel. If you tip in calm waters, flip the kayak over by grabbing both sides of the cockpit and climb back in if you are able. If you are unable to do this, grab the kayak and swim back to shore or shallow water. If your kayak tips while you’re in a current, hold the kayak with just one arm. Continue to face upward to ensure you can breathe. Keep your body horizontal to the surface of the water and backstroke to the shore or shallower water. Now that you’ve learned a few kayaking tips and tricks, it’s time to learn some kayaking skills and techniques you can use in different bodies of water. Each environment you choose to paddle contains variables that will impact the way you kayak. For instance, a flowing river may increase your speed naturally while a steady lake will require you to exert more energy to move faster. Regardless of which body of water you choose to kayak in, it’s a good idea to plan out a route ahead of time. If you’re kayaking in a lake or pond, be aware of shoreline areas which you won’t be able to easily access in the event of an emergency. If you’re kayaking down a river or stream, make sure you choose a route with typically calm waters. It’s best to stay away from areas which could become more challenging if you accidentally paddle too far, especially if you’re new to kayaking. It’s also a good idea to identify spots on your route like bays or accessible shorelines where you can stop to take a break if needed. If you end up off course, make sure you have a nautical map or compass with you. Though GPS and other electronic navigational equipment are helpful, if they were to become inoperable, you would then have a reliable backup with a physical map. You should also be aware of the many forms of wildlife you may encounter in both fresh and saltwater kayaking excursions. Oceans, inlets or bays may contain sharks or jellyfish. Rivers, streams or lakes could contain snakes, alligators or be frequented by other potentially dangerous wildlife on the shoreline, depending on where you’re kayaking. Before you journey out into the water, discover what species of animals you may encounter and how you can safely share the water with them. Learn how to roll your kayak: There’s a good chance your first few trips whitewater kayaking will include capsizing. Learning how to roll and recover will keep you safe. Learning how to low brace will also prevent you from rolling in the first place. Make sure you know how to swim properly in whitewater: Whitewater rapids can be dangerous and not knowing how to safely swim through them can result in injury. Learn the techniques necessary to swim to safety if you end up outside of your kayak. Learn how to cross an eddy line and how to escape a hydraulic: An eddy line is a diving line between currents and a hydraulic is a hole in the river that can trap you. Knowing how to navigate these hazards will help keep you safe. 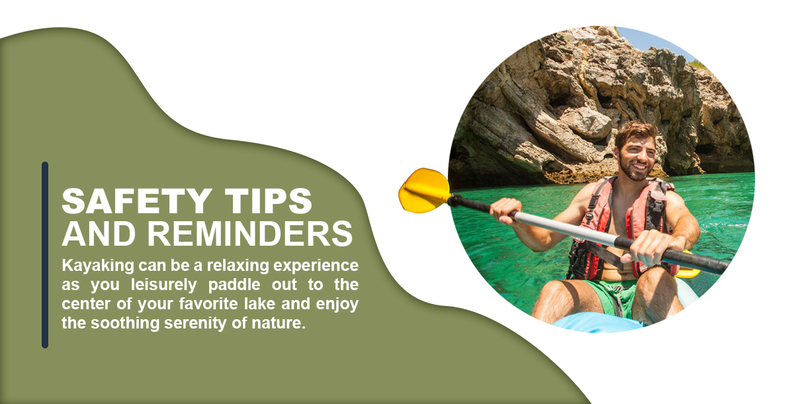 Kayaking can be a relaxing experience as you leisurely paddle out to the center of your favorite lake and enjoy the soothing serenity of nature. Kayaking can also be an adrenaline-filled ride as you test your skills on a river swelling with whitewater rapids. Though both activities offer completely different expectations of fun, all forms of kayaking pose safety hazards. Just like boating, surfing and any other watersport, kayaking can place a kayaker’s health and safety at risk — especially if the individual fails to practice responsible safety precautions. Even though these dangers exist, you can still have a fantastic adventure in your kayak. Creating and following a safety checklist can help you have a safe and fun experience on the water. Can everyone you’re kayaking with swim on their own? Have you prepared a float plan mapping out the names of those who will be kayaking and your projected itinerary, and notified other friends or family members of the details regarding the trip? Are you prepared for sudden weather changes or low light conditions? Do you have a reliable way to call for assistance in the event of an emergency? Never paddle alone: Always have a buddy when out on open water. Always wear a helmet and floatation device: A safe ride is a fun ride. Kayak sober: Never drink or use drugs while kayaking. Be honest about your kayaking abilities: Only kayak in waters you can easily navigate. Do not kayak in bad weather or rough water conditions: Always check the weather report and water conditions before kayaking. If the forecase looks rough, save your trip for another day. While you should always exercise caution when engaging in any watersport or physical activity, kayaking can be a safe and fun experience as long as you practice it safely. Always pack your essential gear, understand the conditions of the weather and water and make every attempt to act as responsibly as possible. Remember — the safe kayaking is smart kayaking. Lake Tahoe, California and Nevada, North America: One of the world’s oldest lakes, Lake Tahoe is also among the most iconic bodies of water in the United States. With over two dozen beaches, you’ll have plenty of access to kayak the largest mountain lake in North America. Galapagos Islands, Ecuador, South America: Venture around the habitats of some of the most extraordinary wildlife on the planet. This stretch of islands in the Pacific presents a once-in-a-lifetime opportunity to witness what inspired Darwin’s theory of evolution. Southern French Alps, France, Europe: Get ready for a thrilling whitewater kayaking experience along one of the many rivers in the French Alps. The Bonne, Ubaye and Durance offer challenging rides for those experienced enough to navigate their waters. Moreton Bay, Queensland, Australia: This coastal region gives kayakers the opportunity to choose from a handful of water-types including rivers, creeks, inlets and lakes. You can island hop the Pumicestone Passage, relax in the open expanse of Lake Kurwongbah or get up close and personal with wildlife at Hays Inlet. Ha Long Bay, Vietnam, Asia: Take an adventurous paddle through one of Vietnam’s most popular tourist destinations. Float through grottos and islands enjoying the serene landscape. Lake Malawi, Malawi, Africa: Lake Malawi National Park is a UNESCO World Heritage site known for its clear waters and beautiful backdrop. Go on a safari like no other as you paddle past wildlife you won’t find anywhere else in the world. From the sparkling waters of the Caribbean to the enchanting waves of the Adriatic, there are plenty of amazing places to kayak — including rivers, lakes and oceans that may be right in your backyard. Once you begin kayaking, your options for adventure are limitless. Are you ready to get out onto the water and begin your kayaking adventures? At EZ Dock, we’re confident that with a little practice, you’ll be on your way to mastering your new hobby. We want to help make your kayaking experience as smooth as possible with our residential kayak launches. Unlike wooden docks, our EZ Kayak Launch won’t splinter or peel and is durable enough to endure extreme weather conditions. Why are our EZ Kayak Launch floating dock systems ideal for your waterside? They’ve got integrated paddle notches to make launching and docking safe and effortless. They’re a one-piece system that rises and falls with the water level without incurring damage. They’re slip-resistant and won’t splinter, giving you a safe dock to walk on. The EZ Launch Accessible Transfer System goes beyond ADA requirements to provide kayakers of any age and ability a safe and convenient way to enter and exit their kayak. 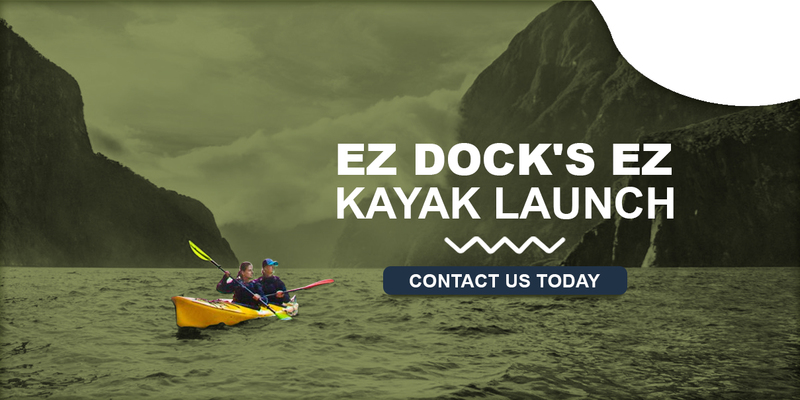 To learn more about our EZ Dock Kayak Launch, contact us today for a free quote.